Anyone been to Elske or Entente (or both)? I will be heading to each place in the next couple of weeks and did a search to prepare and there do not seem to be any posts related to either. In any event, I'll plan to report back. I've been to Entente twice already; heading back again at the end of the month, so obviously I am a big fan. First visit went with another couple and we shared the entire menu. Felt dishes ranged from good to outstanding. For the price, the creativity and quality is an amazing deal. Definitely save room for dessert, because they are stellar. Loved the vibe and extremely friendly service as well. Elske I went to opening weekend; was mostly positive, but a couple to-be-expected opening gaffes (both in service and food). However love the concept they are striving for and super talented people behind Elske. Am returning next month and am expecting it should be a wonderful experience. Am hoping it will be a warm enough evening to take advantage of an after dinner libation by the fire in their beautiful outdoor area. Thanks for the feedback Suburban Ronnie and Gonzo. As I review the menus they look similar in concept (and price point), including bread service charges , so visiting within a couple of days of the other should be a good compare/contrast exercise. I love the order the whole menu gambit - looks possible at both places given our hungry 4 top groups. Will report back. Also, I can't remember the name of the predecessor (perhaps with an intervening place) izakaya in the Entente space, which I liked very much, but the back room there always felt a little deserted and cold because the front bar had more action - though it strikes me the opposite might be true at a place like Entente. Interested to see what they've done to marry the two. Also, fireplace at Elske sounds great. Ahmad Shareef wrote: Also, I can't remember the name of the predecessor (perhaps with an intervening place) izakaya in the Entente space, which I liked very much, but the back room there always felt a little deserted and cold because the front bar had more action - though it strikes me the opposite might be true at a place like Entente. Elske just got a great review from Phil Vettel, however my experience was not as great as his. I was there a couple nights ago. The courtyard is beautiful, even on a damp gross night, and it had the wonderful smell of a campfire coming from an outdoor fireplace, however the inside of the restaurant had that same smokey smell and it permeated my clothes, hair, nostrils, etc...I could've done without it inside (apparently they have another fireplace in the kitchen or something). Our table chose to do the tasting menu after much debate, and perhaps that was the mistake. Several of the courses were really more like an amuse that other prix fixe restaurants wouldn't include as a course, which surprised us. 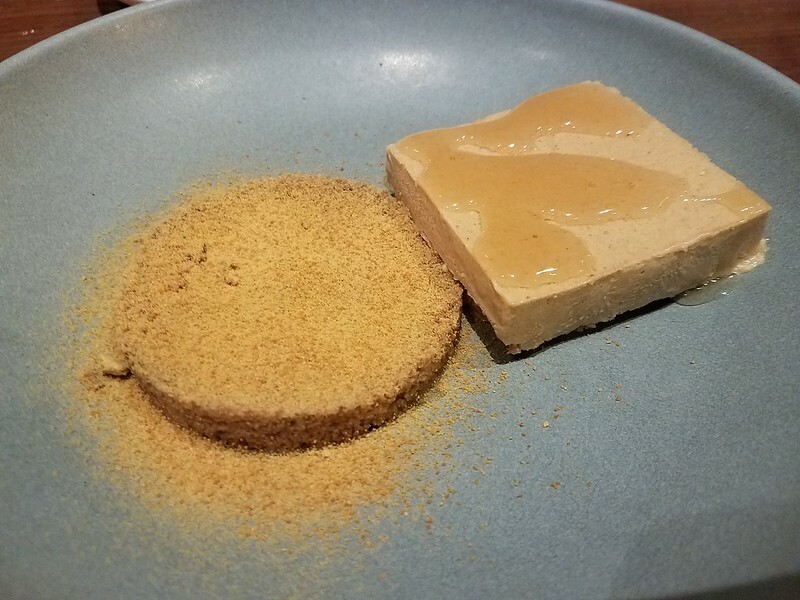 The duck liver tart was very good, but we weren't given individual plates or silverware with it, it was a little slice that was supposed to be eaten by hand, which most of my party wasn't thrilled about. The bass confit was quite good, probably my favorite of the courses, though one of my dining companions said her's was fishy. The wagyu flat iron was cooked perfectly and totally delicious, but the rice cakes that were paired with it were chewy and awkward. I didn't get the combination. The last two courses were really not appealing at all, no one at my table liked either, the frozen fennel chew with mint (again more of an amuse than a course), tasted more like a licorice gelatin and the "sundae" had a terrible texture, it was much too soft and too sweet and overall barely edible. Service was friendly, but they insisted on holding on to the bottles of wine and came around too infrequently to refresh glasses, which was frustrating. I did the juice pairing with the dinner which I thought was really cool that they offered, but I wished I hadn't done it (there was the option to do this a la carte, I only really liked one of the juices, it was like a citrusy cold chamomile tea with some froth, I can't remember the details). We did order an extra course of the sweetbreads and they were excellent, so the key may be not to do the tasting menu next time, however I don't think there will be a next time for me. I felt it was too expensive for being too uneven to warrant a return visit. It was tough to truly split the previous Elske and Entente thread into 2 because some of the posts contain content about both places. But we did our best to part them on a going forward basis and this one is for Elske. Circling back to this with a report since I started the (now split) thread. In general, I wasn't nearly as impressed with Vittel, and although I would return, having had a the vast majority of the menu I will definitely wait until there are some significant changes. I am rooting for the place though, as it's a fun space, and is ambitious, and the kind of place I would like to see more of in Chicago. 1) Rough service, other than the somm who was a very helpful, genial guy, and an interesting wine list. We had a rose champagne and I think a sangiovese that he guided us to. And some Amaros and Byrhh by the fire. 2) Good room/outside area. The fireplace has been described, I think, but it is really nice and we were there on one of these unseasonably 50 degree Winter days that we've been having. A little awkward as there was a couple of women out there having an intimate discussion and we had to muscle in a bit for blanket use and space, and then our conversations kind of clashed, but still a nice concept. I am interested in seeing what they do with the yard in the Summer - hopefully some outdoor dining options. I liked the spirit and simple clean feel of the dining room also. It was a Saturday and a packed with a bumping crowd having a good time, and (once we got some attention and drinks) were carried by that despite some grouchiness from service issues. 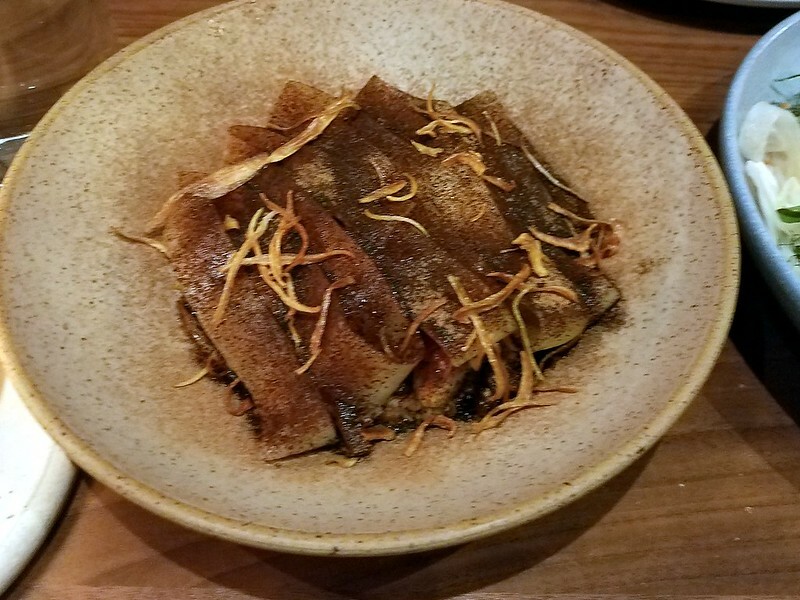 3) Salty skate wing - nuff said, this wasn't edible, and too bad cause it seemed like it had potential. 4) Meh egg/chicken thigh and lamb - disappointing as I had heard good things about the omelette and the lamb sounded good. The former was lacking in chicken and any real assertive flavors and the lamb was underseasoned and overdone in my opinion. 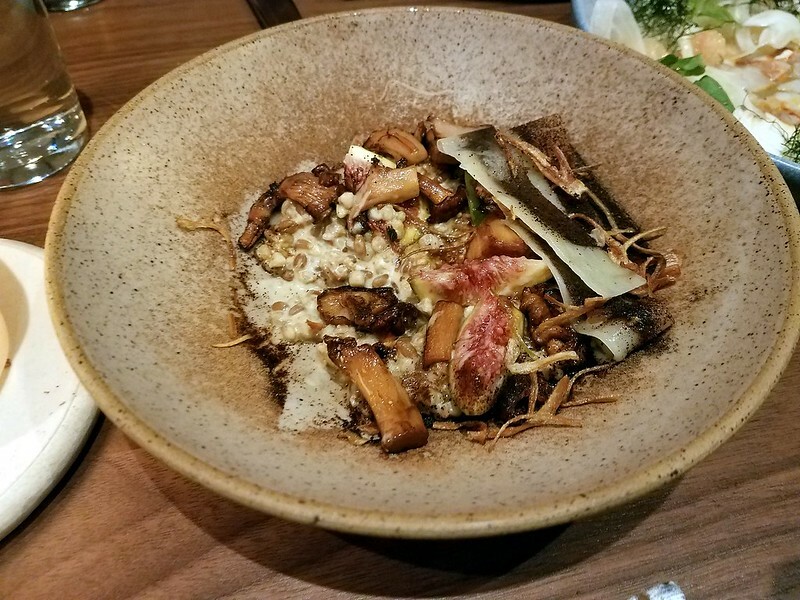 5) Get the salsify dumplings and maitake - great dishes; really wonderful. Just bursting with flavor. 6) Comically small octopus portion - too bad because it was good. We got 2 orders for the 4 of us and each person got two one inch nubs along with the ruffage. I don't like to beat on places for portion size because often we end up stuffed because of, well, big eyes primarily, but also being served too much, but the general theme here was smaller sizes (both in the small and large items). We ordered everything on the a la carte menu but the sweetbreads (a shame, but someone in our group with an aversion), including two octo and two lamb and still came out with some room left (though no need for chili-cheese fries at Floyd's on the way home, like after one of my Bonsoiree meals). As an aside, can anyone explain octopus pricing to me? It is often very expensive at restaurants (Bella Notte appetizer is a tasty good value at $11 or $12), though not so much at the fish monger. Extra prep time? 7) Odd desserts. I don't remember them very well, other than some interesting textures - perhaps a beet flan? In any event, no chocolate bombe here. Or anything else you've heard of. This could be fun but I wasn't blown away with these. Again, the uneven service won't keep me away as our visit occurred really early (hopefully) in Elske's life cycle, but the uneven preps will. For now. Like I noted, I am interested to see what they do outside in the Summer. 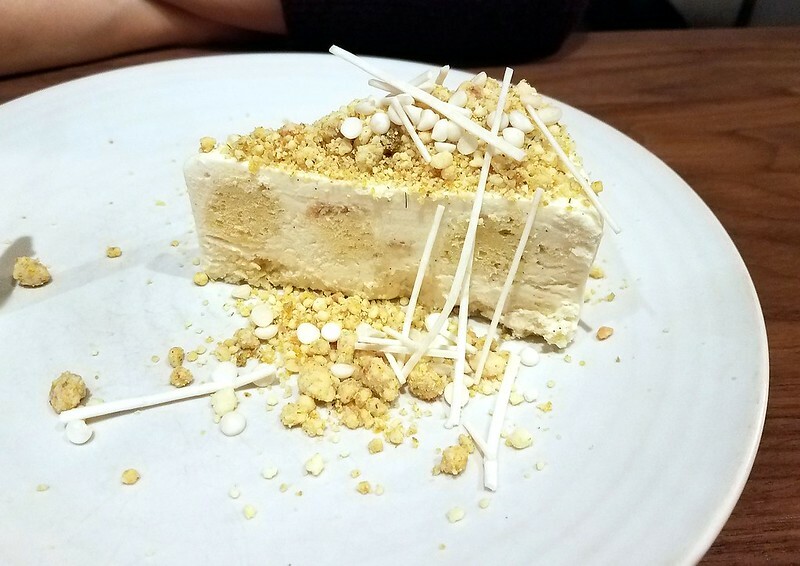 Chicago is home to many pricey temples of fine dining (Alinea, Oriole, Grace, et al), but chefs Anna and David Posey wanted to create an alternative to the overly formal, often dauntingly expensive prix fixe experience. “We both like very fancy things, but we like going about them casually,” Mr. Posey said. 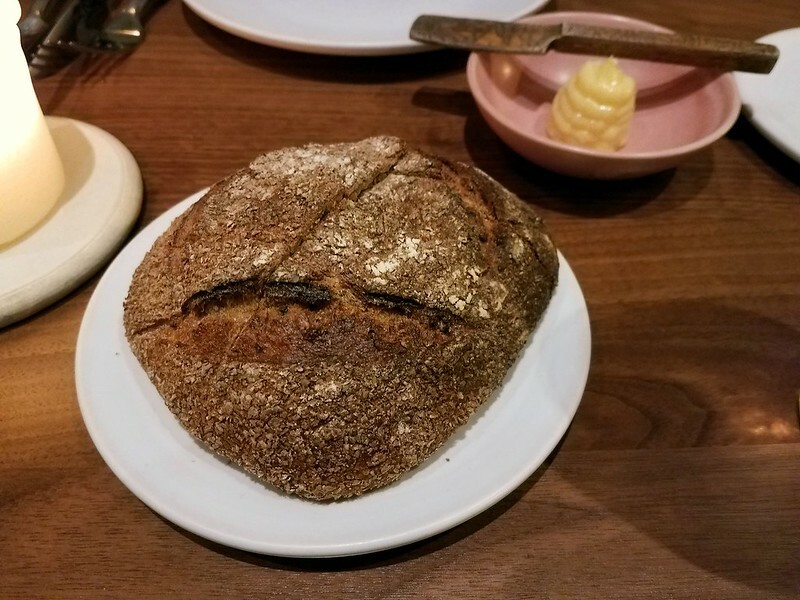 The result is Elske, which opened in December in the restaurant-rich West Loop, offering a relatively affordable tasting menu ($85) and à la carte options that nimbly blend Midwestern and Nordic sensibilities. 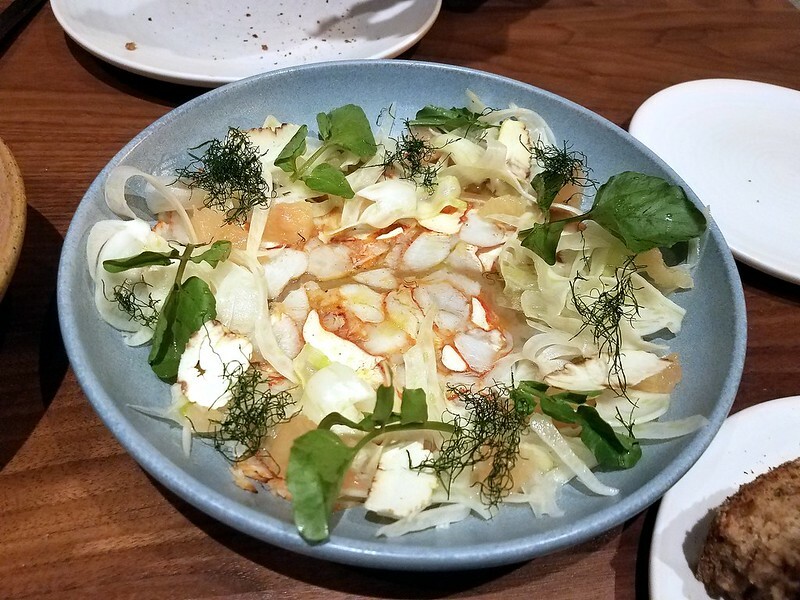 The reviews have been so curious: the out-of-towners love it--Bon Appetit named it as the #2 Best New Restaurant in 2017; Eater named it to its national list of best new restaurants--yet it got mixed reviews from both Sula and Ruby locally. Going to try and swing by next week and see what's what. Both Elske and Entente were awarded one Michelin star. Elske: classic in approach, the challenge here was to look past the often unprepossessing appearance of what was set down in front of us. We were often caught off-guard by how a dish looked and, our fault, I suppose, but it made an impression on us before we ever sank a fork into anything. Thus, the lobster terrine, to pick one example, looked nothing at all like any terrine we had ever seen. And disappointment, on some level, kicked in. On the other hand, once we tasted it (or at least, once I tasted it, in this particular example) we learned to trust and appreciate what the kitchen did. The layers of flavor in each dish were surprising in the best possible way. We enjoyed the meal a great deal and liked the ability to linger over the courses. It’s an unprepossessing place and we liked the informality. But mostly, we really, really liked the food! Depressing when I first looked at it. But an extraordinary melding of flavors, one of the best dishes of 2017 for me. 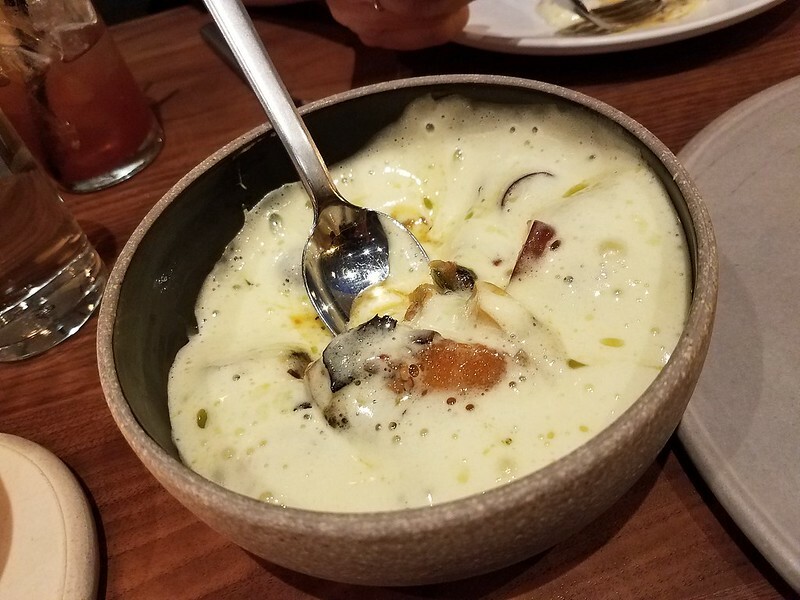 Grilled squashes with pumpkin seeds, grapes and "savory sabayon"
Presentation may not be the most enticing thing I’ve ever seen but the flavors were absolutely wonderful. Terrific dish. For reasons we don’t quite understand, even after having the restaurant’s approach explained to us, the presentation seems about as far as you can get from what we have always understood a terrine to be. For that reason, its appearance, upon initial presentation, was a letdown. The LDC didn’t particularly care for its deconstructed flavors. I enjoyed it. 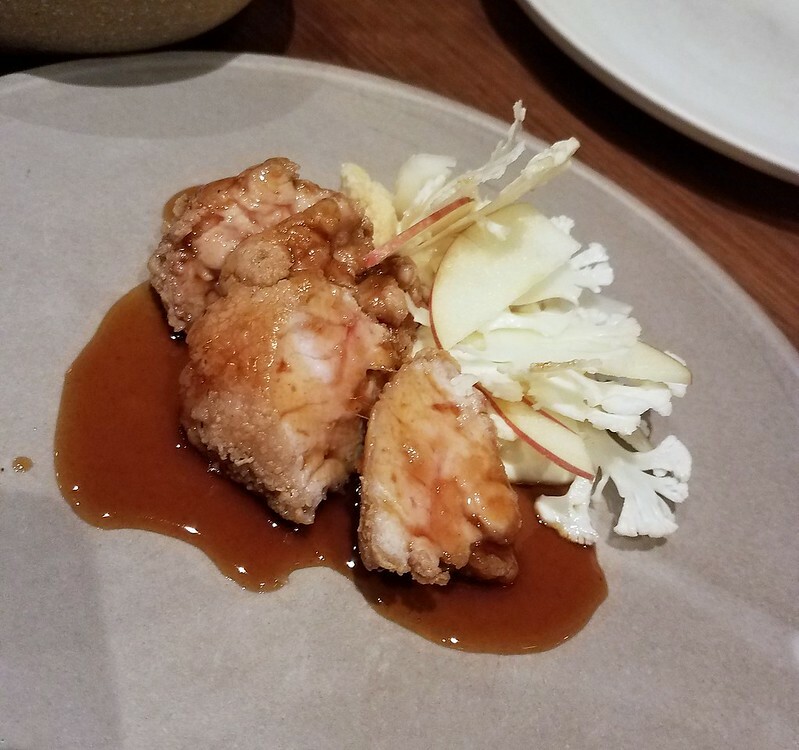 Among the best sweetbreads I’ve ever had anywhere. Had a great meal there 2 weeks ago. highlight was the koji butter in their bread course (PQB). Also, the firepit was open even though it was 37 degrees and lightly snowing. We sat out there with some glogg.